Nihola - J.C. Lind Bike Co.
Nihola was conceived in 1998 when Niels Holme Larsen, a Danish mechanical engineer, took it upon himself to design a cargo bike that could carry two kids and groceries at the same time. The feature that has gained Nihola so much notoriety and praise over the years is his design's unique steering linkage (called Ackerman Steering), which turns the wheels independently of the cargo box. 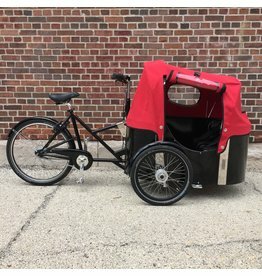 The result is a bike with surprisingly intuitive and familiar handling for a cargo trike with a 2 or 4 child capacity. In a bike shop chock full of Dutch brands, its nice to be able to rep a Danish company that's also doing a great job at engineering quality bikes, and doing its own share of work in making the country of Denmark a notable bike-centric culture. 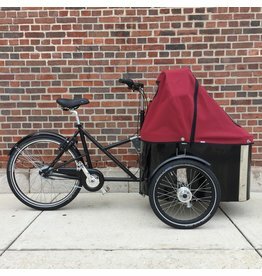 The Nihola Family trike features a unique steering linkage that allows the front wheels to turn independently of the cargo cabin which seats two child passengers. The Nihola 4.0 trike features a unique steering linkage that allows the front wheels to turn independently of its spacious cargo cabin accommodating four child passengers.